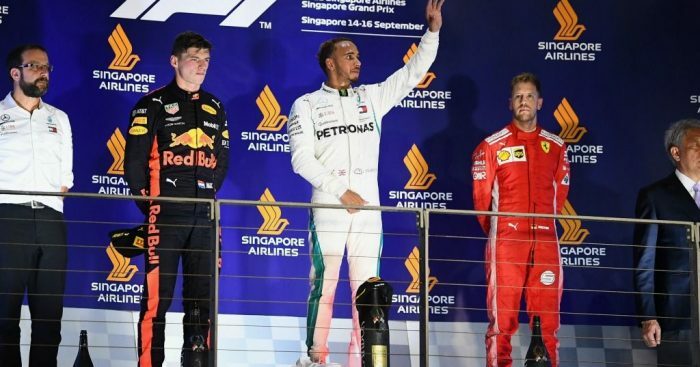 Race winner Lewis Hamilton, along with Max Verstappen and Sebastian Vettel, spoke to the media after Sunday’s Singapore Grand Prix. SV: No, I will always defend the team. I think the decision we took in the race, the decisions to try to be aggressive, if it works it’s great, today it didn’t work. Obviously it didn’t work by quite a bit and we need to look into that. But I believe we saw something and that’s why we go for it. Obviously inside the car it’s difficult to be on top of everything because you cannot see where you come out etc. We were aggressive in trying to get ahead, taking into account that we have to go through traffic, which in the end bit us also, to lose the second place. If it doesn’t work it is always easy to criticise but I will always defend what we did. Overall, we had a very strong package, both Kimi and myself, I think we looked very competitive throughout practice but in the end if you look at the race result we finished third and fifth. Like yesterday, probably not where the speed of our car belongs so that’s what I mean by saying we didn’t get everything out of ourselves. Q: (Phil Duncan – PA) Lewis, you said earlier that you didn’t expect to leave here adding ten extra points to your championship lead – so how big a boost is it to your title chances, winning here again, given that we always seem to think this is a Ferrari circuit? SV: Well, Lewis said he didn’t expect to come here gaining ten points, we probably didn’t come here expecting to lose ten points – but, having had the race that we had, I think there’s a full justification for losing those ten points and we take it. Obviously, there is still a long way to go and a lot of points to score. I never believed that we had the fastest car by a big margin, as people said. I know that we have a very good car. I think we started the season well and then we were about half a second behind in qualifying and it was crucial to get back, which we manage to – and then we had a bit of a rough time but overall I think the speed is there but I think it’s a match in qualifying as much as in the race. Today, if anything, I think we were a little bit slower, which we need to have a look and understand – but also it’s difficult to draw the conclusion because our race, my race was very different. I was on the oldest tyres and probably on the tyre that was not supposed to last that long. You would probably like to go out and do the same stint on the same tyres, just to be able to compare – but that’s not the race that we had today. So, you know, that’s what it was this weekend. Russia, I think, has been getting better the last years for us, so it should suit our car as well. I don’t think we have any tracks to fear that are coming. I think our car is working pretty much everywhere and that’s a strength of our car, so no need to be afraid of what’s coming. SV: I think first of all we’re not playing a silly game, we’re quite serious and it’s quite tough competition, so the level of competition is very high and if you have the slightest mistake obviously there are people there who are usually there to benefit from it. I think today, you know the race that we had showed that Max was there straightaway to benefit. Maybe sometimes you are lucky and it’s not showing as crucial but today it caught us and what we tried didn’t work and also caught us out so it didn’t help but I’m happy to try, I’m happy to try being aggressive to try and win. That was the ambition and especially on a track where it’s difficult to pass you need to try and figure something out. Yeah, but overall I think it’s not the result that we wanted and it’s a disappointment because we came here thinking that we are very strong. I think we were but not strong enough, not as strong as we probably wanted to be in terms of raw race pace. Yesterday, I still believe we could have had a better day but it’s history so – same as today – we need to look forward. There are a couple of differences that are standing out about yesterday, about today, things that we can learn from the others, because they simply did a better job if they finish ahead of us by half a minute, so clearly they did some things better than us. LH: Good question, thank you, I appreciate it. It’s hard up here because it’s like an anti-climax. Naturally it was a hard race but we need to keep the energy up because this is a special moment for me and for the team. Was it an exciting race, or not really for you guys? That’s probably why. I definitely heard a couple of people snoring here. Honestly, it’s just great teamwork, very very diligent engineering. The guys obviously back at the car, we’re constantly learning about the car and refining it but we’re bring out upgrades every now and then but it’s pretty much the same times as they (Ferrari) bring theirs. But it’s more understanding the tyres, it’s more getting more comfortable with hitting the nail on the head with the balance of the car and really just eking out each little bit and each weekend we’re got incredible communications. The debriefs are really really solid, there’s a lot of direction that comes from the debriefs. I give quite long debriefs nowadays and we work to the point that we leave no stone unturned, there’s not a single stone unturned each weekend that we arrive and so it’s a real collective, it’s just the strongest the team has ever been in terms of how we communicate. We’ve got great people in the team, both at the factory and here and it’s a real privilege to work with everyone and also we’re all so comfortable with each other and there’s a huge confidence within the organisation. And in terms of my driving, as I said, I have these others things that I do outside which are stimulating. I know there were questions at the beginning of the week whether it is distracting and naturally you come here and if I put one foot wrong, people are going to point to the things that I do outside as a result of it. You can see, it doesn’t affect my performance and if anything those things they add to the performance really. Healthwise, I’m super healthy. As I said, I went on a plant-based diet last year – here, actually, I started here last year – and it’s been the best year of my life physically.